Lavalieres (also spelled lavaliers) are pendants that are suspended from a single chain. 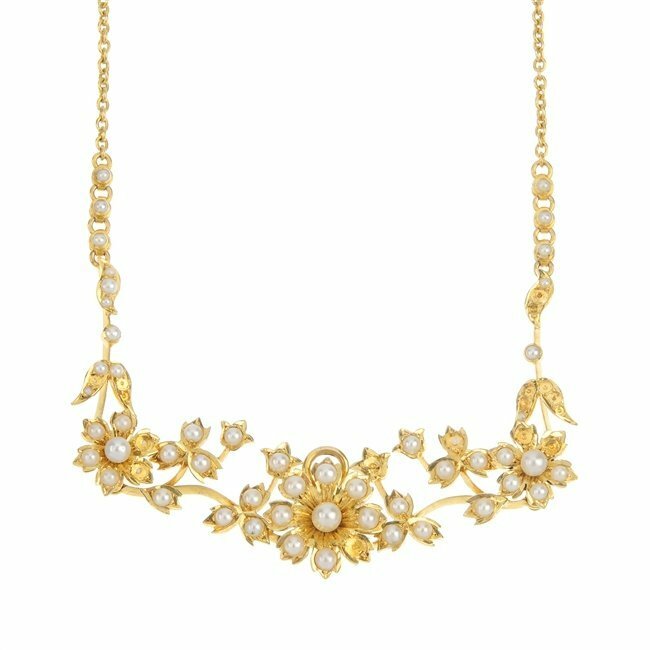 They often refer to a style of necklace from the turn of the century through about 1915, usually in yellow gold and accented with seed pearls. Fellows Auctions has a stunning array of these antique pendants coming up in their July 17th Antique and Modern Jewelry Auction. Check out some of my favorites below, and click the image to be taken to the auction listing. Don’t forget to pin your favorites using the pin-it icon on the left sidebar or bottom share button for mobile. LOT 13: An early 20th century 15ct gold amethyst and split pearl pendant. LOT 21: An early 20th century 18ct gold gem-set and seed pearl necklace. LOT 362: An early 20th century 15ct gold split and seed pearl floral necklace. LOT 395: An early 20th century 15ct gold split and seed pearl floral necklace. LOT 626: An early 20th century gold and silver diamond pendant.